Chicago, IL (April 3, 2019) -- The world’s biggest Star Wars collecting sites have come together to form an unstoppable collecting alliance. Acclaimed fan sites and podcasts Creature Cantina, Rebel Scum, Star Wars Action News, This Week in Star Wars, and Yakface are givinAg away an exclusive puzzle-patch set at Star Wars Celebration Chicago. When combined, the full six-piece forms an image of iconic Star Wars villain Darth Maul, commemorating the 20th Anniversary of Star Wars Episode I: The Phantom Menace. 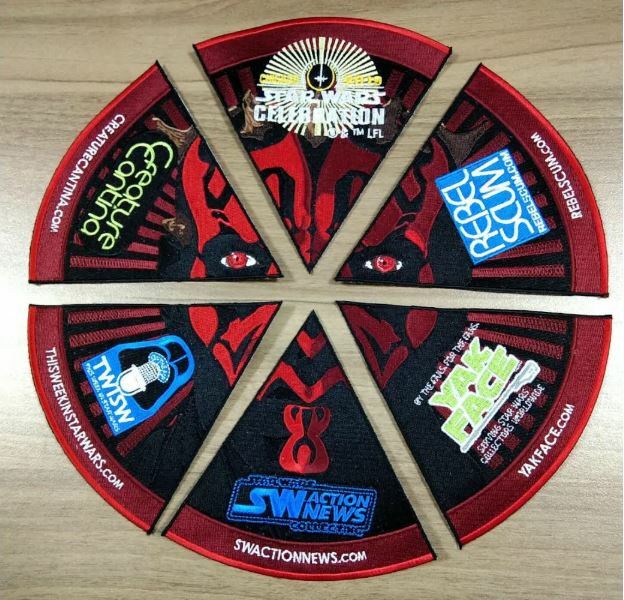 The patch set will be given away exclusively as part of the Star Wars Celebration Chicago Collecting Track. Fans are invited to stop by and meet the faces behind their favorite collecting sites at scheduled times in the Collecting Track Social Area. The exclusive patch set is available while supplies last, so fans are encouraged to arrive early! Creature Cantina - Friday, April 12, 1:30 p.m.
Rebelscum - Saturday, April 13, 10:30 a.m.
Star Wars Action News Saturday, April 13, 4:30 p.m. This Week in Star Wars Sunday, April 14, 12:00 p.m.
Yakface Sunday, April 14, 4:30 p.m. The sixth puzzle piece will be given away at random times during events in the Social Area, which is also where fans can enjoy Q&As with Collecting Track Panelists, collector meet-ups, live collecting podcasts, trading, and more!